When looking at patio furniture for your outdoor areas for entertaining, Cheap Outdoor Patio Dining Sets should be on your list. Small areas in your outdoor space will lend themselves to different types of relaxing. If sitting around your table with snacks and your favorite adult beverage if what you like to do, a conversation set is what you need. Looking for spot to have a small meal by the BBQ, a small dining set will work. I like the idea of eating outside sometimes to change our meal atmosphere, I have an outdoor dining set at home and at the lake. Sometimes we just have a burger or other times we will cook a full meal and have it outside. This makes for great family time and conversation. Don't want to break the bank and still get a great patio dining set for four under $500, look at my examples here. I have a set very similar to the Nantucket set at the lake. It stays in the garage until I need it. 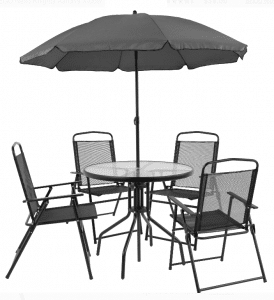 Chairs fold for easy storage and it is lightweight for easy moving, having an umbrella included is a plus. Now lets look at these four examples and see what style you like the best. For those with a smaller outdoor space or wanting not to leave up their dining table all the time, this set with folding chairs will work. Four chairs, a small table and an umbrella will be included in this set. A round glass top table will let you enjoy your meal, smaller than most at 31.5 inches across. A tempered glass top with hole for umbrella support. Only assembly of this set will be adding legs to table top then adding lower leg support that will also support the umbrella. Umbrella will be 5 foot across when extended. No tilt feature will be included with this umbrella. No umbrella base will be included either. Chairs will fold for storage, a little lock on each back leg will have to be moved for folding. I find this lock hard to work at first, some fingers may get damage if you are not careful. Each chair will support 250 pounds of weight. This set will work great for those who need their outside space for other things and want to store their dining set when not needed. I fold my chairs and place on top of the table in the shed at the lake and it is always ready to just sit up in minutes without any trouble. To look at the Albany Lane model that I have, see my post here. 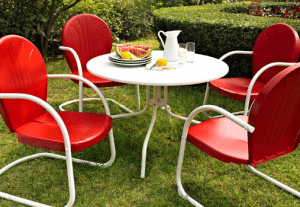 If you like the retro look in outdoor furniture, this dining set from the Crosley Collection will look great for you. With its timeless steel frame and look, you can get one at most flea markets or just purchase them new like the Griffith model here. The flea market variety will probably cost more to restore than purchasing this set. Set will include a white table with a round top that is 40 inches across. Four legs with a lower support will support your table. A hole in the table top will let you use an umbrella, not included in this set. Chairs will have the timeless design with some motion. Seat base and backs are available in four colors, Blue, Red, Green and White. All frames are white. Chairs will need some cushions to be comfortable for long term sitting. This set will work best for those looking for a more traditional look, this set has more of a retro look than any other. This retro look can be purchased in many styles, see my information on the retro collection here. For those looking for a metal dining set that will require very little work and will look great, this set will work well. With a cast aluminum frame and a woven design for the seat and table top. A gentle open weave will cover the backs of the chairs. No cushions or umbrella are included with this set. Table will have a round top that is 31.5 inches across and 28 inches tall. Four legs with a lower support will support the top. Hole for umbrella will be in the center of the table and in the leg support. Chairs will have straight legs and could use some cushions to extend sitting comfort. Each chair will support 220 pounds of weight. This set will be for those who have an outdoor space to leave out your dining set and when they want to use it, just clean the top of the table. The cast aluminum look will give the look of a park setting for your outdoor space. When you are looking for long term sitting comfort when shopping for Cheap Outdoor Patio Dining Sets, the Highland Knolls set will work well. With padded sling material for the sitting area and a swivel base for the chair, you will have hours of comfortable sitting with this set. I am a firm believer in the sling material for seating comfort in outdoor patio furniture. This set is no exception. With a poly padding between two layers of sling material, this set will take a little longer to dry after a rain storm. Each chair will have a stick on the bottom of the seat base that fits in a hole in the chair base that will allow this set to swivel. No rocking motion is included. Each chair will support 250 pounds of weight. Table will have a tempered round glass top with hole for umbrella, not included with this set. Table is a large 48 inches across and 28 inches tall. Four legs will support the table with a round support for the lower legs. This set will be for those looking for long term sitting comfort in their dining set. With cushioned seating that swivels, you will get many hours of sitting comfort with this set. Other sets and pieces are available in this style. See my post on the bistro set here. 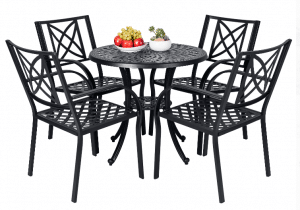 I have given you four different choices for you cheap outdoor patio dining sets. Each one will have its own advantages for its owner. You will have to look at your needs to help make your choice. I have a similar set to the folding chair set at the lake, it is very easy to store when not needed. I like the sling material for seating comfort and its ability to dry quickly after getting wet. Your choice could take you in a different direction. Choose where you are sitting your dining set and what style will work best for you. Any questions or comments on this post, use the forms below. I will return an answer shortly. I love the Mainstay Highland Knolls. The bigger table is very nice and softer seats. Living in a country where we live and eat 90% of the year outside … this is and excellent choice. Our average winter temp. is 24*C and summers goes up to 40*C. Sitting by the pool having lunch will be perfect. Thanks for looking at my post and leaving a comment. 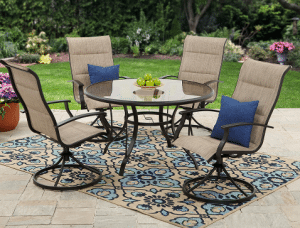 The Highland Knolls set will give you plenty of comfort for your outdoor dining. I’m just like you John. I love to relax and eat a meal outdoors. Whenever I go to a restaurant I always choose an outdoor table, weather permitting. I also love to barbecue so having a nice outdoor table at home is a must. And I absolutely love the Crosley Griffith retro set! Thanks for sharing. The retro set is a very nice set for dining. This collection offers many other pieces so that you can add to it in the same style. Is there a store like this where you live. Some of these items are available at other vendors that do ship overseas. 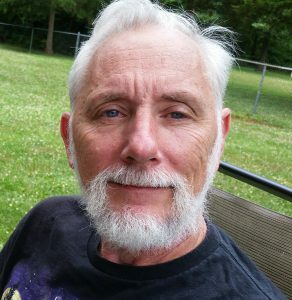 Great article John! I love the way you always bring me to earth with your pros and cons list. I usually get impressed by aesthetics and don’t take into consideration the practical side of the patio furniture I buy. Keep up the good work ! The pros and cons can help you make an educated decision when looking for patio furniture. Just looking at the pictures can be bad when trying to purchase any product. Thank you for putting this list together, I’ve been looking to replace my current patio set with something else but didn’t know where to start. There are so many options and price ranges, it can almost be overwhelming. This is a great resource, thanks! Let me know what your needs are, I will walk you through what to look for in your future patio furniture needs. I love outdoor patio dining sets, and i love cheap haha, i always love outdoor patio dining, thank you for the information! 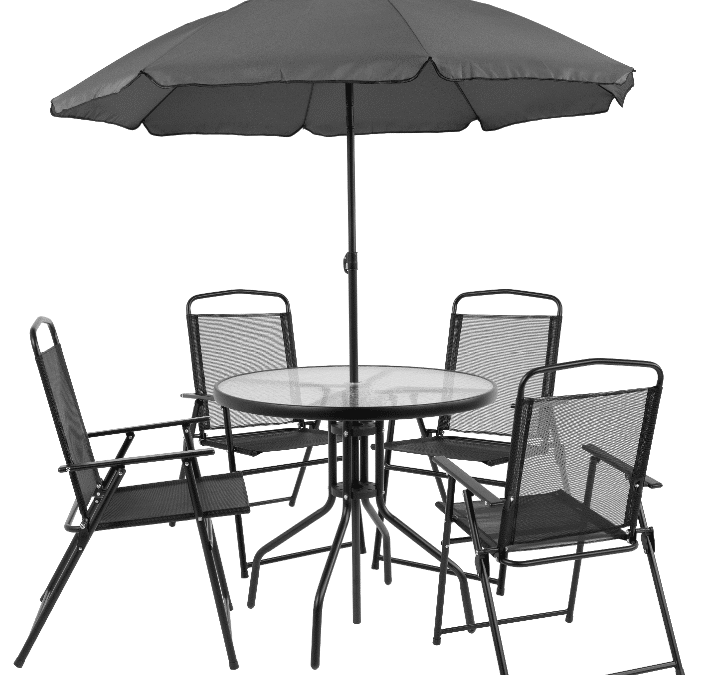 Having an outdoor patio dining set will make your patio space more usable during the warm months. Each person will develop their own style and needs. The Mainstays Highland Knolls Dining Set looks excellent. My Dad is moving to Oregon and he will be sure to need an outdoor dining set for his new home. It is a set worth serious consideration. I do have a question though. Do you have a ‘how to guide’ for deciding between dining sets? He likes to weigh all of his options and factors before making his final purchase. I look forward to reading your reply. Since each outdoor space will be different and used with different needs in mind. Knowing how many butts you will sit and how much space you will have, this will be your first step. If you dad will send me a note, I will help him with his needs.